Indian national Udayan Panicker passed away in Kuwait. He was 63 years old. He left behind his wife Devi Udayan, daughter Chippi Udayan and son-in-law Nishanth. He was in Kuwait for the past 38 years. He was an active member of Saradhi Kuwait. My hearts are saddened by your loss and our thoughts and prayers are with you. 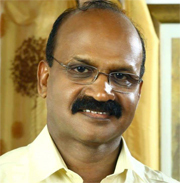 Udayanji will be remembered forever as a sincere, dedicated and motivating teacher for Sanskrit language in Kuwait. My sincere condolences to the bereaved family. May his soul rest in Nithya shanthi! Our prayers for theAthmasanthi of his soul and prayers for his wife χldren to comeout of this shock. Heartfelt condolences to the breaved family. May the soul rest in peace. Hearfelt condolences. We pray almighty for his soul to merge with God. May his soul RIP, Heartfelt Sympathies to the family. heartfelt condolences, Could anyone please let us know whats is the reason for death?? Heartfelt condolences to his family. It''s a great loss to Indian community in Kuwait. He was a good teacher for Sanskrit language and spiritual guide and seeker . we pray for his soul to reach divine lotus feet.